VTech understands that for parents, selecting the right baby monitor is an important decision, based on each family’s unique needs. Today, VTech® Communications, Inc., a wholly owned subsidiary of VTech Holdings Limited. (HKSE: 303), announced the addition of four new monitors to its award-winning Safe&Sound® baby monitor line. With new models that come standard with 1,000 feet of range and various feature combinations that can include temperature sensors, a talk-back intercom, glow-on-ceiling night light, audio and video options, and rechargeable batteries on the parent units, parents can feel confident that they have a reliable, high-quality system. “Every family approaches parenting differently, so we’ve designed an assortment of Safe&Sound® baby monitors that allow parents to choose the best unit for their style. Whether they want a simple audio monitor or would prefer an option with audio, video and soothing lullabies, VTech offers the product versatility that they need,” said Matt Ramage, senior vice president, sales and product management, VTech. When considering a baby monitor, parents should also think beyond the immediate needs of infants or toddlers. VTech’s products come equipped with features that can be used as children enter early stages of independence and additional monitors can be added to the system to keep an eye on multiple children in different rooms. Some families even use the monitors to ensure their pets aren’t getting into any mischief. 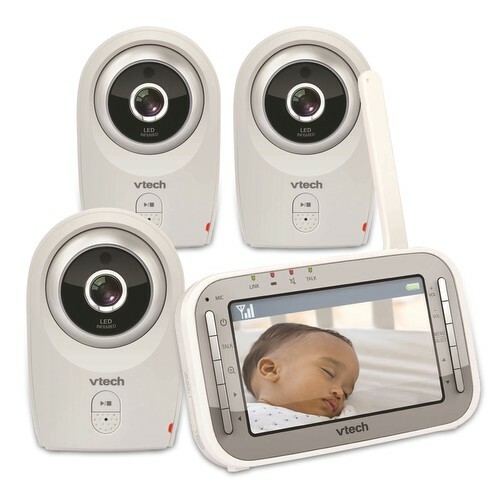 VTech Safe&Sound Pan & Tilt Full Color Video Monitor (VM343)—Scanning a baby’s room from the parent unit has never been easier thanks to the VM343 monitor’s remote pan and tilt camera featuring 2x zoom. Full-color video equipped with night vision on a large 4.3-inch LCD screen ensures parents always have the most vivid image of their child. When little ones need soothing, parents can use the two-way, talk-back intercom without entering their child’s room. The monitor can expand up to four cameras, allowing parents to keep an eye on their little ones from multiple rooms at the same time. Digital transmission ensures all videos are private and secure, while cutting down on background noise. 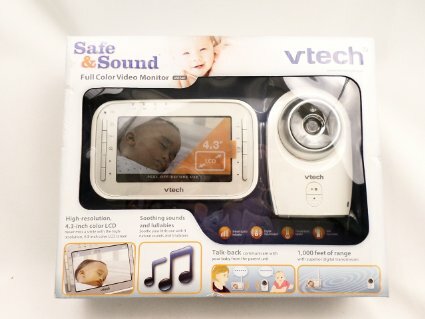 VTech Safe&Sound Full Color Video Monitor (VM341)—In addition to monitoring your baby on a full-color, 4.3-inch screen, this model comes equipped with lullabies, white noise and three additional nature sounds, doubling as a helpful tool in soothing your baby to sleep. For parents in need of some quiet time, they can mute the parent unit, but still easily monitor sound in their baby’s room through graphic bars on the parent unit that indicate the level of sound on a scale from zero to nine and a vibrating sound alert. 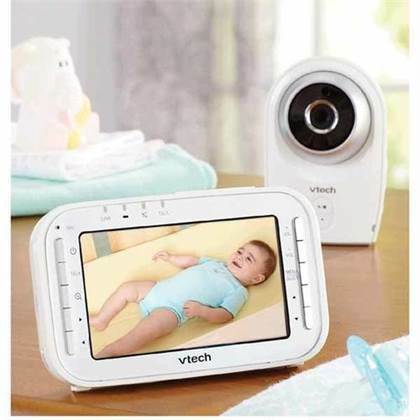 VTech Safe&Sound® Full Color Video and Audio Baby Monitor (VM312)—Full motion video with up to 22 frames per second ensures you never miss a move your child makes. Eight infrared LEDs provide clear video even in dark rooms and a temperature sensor lets you know when it’s time to adjust the thermostat. Thanks to the talk-back intercom, parents can comfort their little ones from any room while viewing them on a 2-inch high resolution, color LCD screen. VTech Safe&Sound® Digital Audio Baby Monitor with Glow-on-Ceiling Night Light (DM222)—This model features a lullaby and a glow-on-ceiling night light that projects a moon and stars scene to soothe and calm your baby. This audio-only monitor has a full 1,000 feet of range so parents can clip on the parent unit and move about their house and even yard with confidence they are still getting a signal. And parents can rest assured their monitor is protected against interference and eavesdropping with its DECT 6.0 technology. VTech is the world’s largest manufacturer of cordless telephones, and the largest supplier of electronic learning products from infancy to preschool in the US and Western Europe. It also provides highly sought-after contract manufacturing services. Founded in 1976, VTech’s mission is to design, manufacture and supply innovative and high-quality products in a manner that minimizes any impact on the environment, while creating sustainable value for its stakeholders and the community. Originally published on 2015-08-19 by Lacey Wolfe at A New Age Mama .